There’s a new DC TV series coming to The CW next year, joining the likes of Arrow and The Flash. As you no doubt know by now, it’s called Black Lightning and will star Cress Williams as Jefferson Pierce, a high school principal who has to return to his old life as the titular vigilante after his daughters are caught in a gang war. Though we’ve already got a promo image along with a first trailer, we still haven’t seen too much of the show just yet, but that could be about to change. 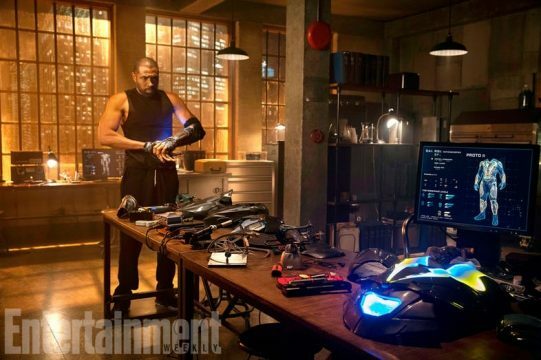 Entertainment Weekly has just delivered a ton of new information on the series while also bringing us the below image, which is from the pilot episode and sees Jefferson touching up his suit. Williams also talked about what powers Black Lightning will and won’t have in the show. In particular, the actor revealed that the character can’t fly as he can do in the comics. At least, not right away. However, Williams has high hopes that they’ll get to that eventually. Another of the Arrowverse’s tropes is to give the hero an invaluable tech support character – e.g. Cisco Ramone, Felicity Smoak, Winn Schott, etc. While Black Lightning isn’t rushing into introducing such a figure, Williams expects comic book character Peter Gambi to be included at some point. Black Lightning is set to begin filming next month in Atlanta before airing on The CW in January 2018.